HH Kyabje Dorzong Rinpoche The Eight, Ngawang Yönten Chokyi Nyima, enter into Parinirvana on March 16th 2017 in Taiwan. He remained 16 days in Thugdam. 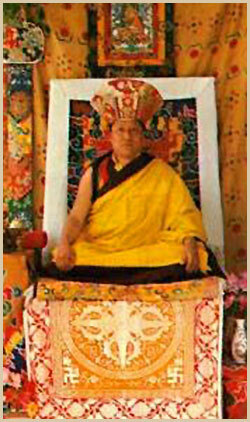 His Kudung was taken to Khampagar Monastery, Tashi Jong Community, H.P. On April 19th around 09:30am, the cremation ceremony will be held at Dorzong Monastic Institute, Jangchub Jong, H.P. For further information please go to Facebook/Dorzong Monastic Institute and Facebook/Jangchub Jong Monastery. for the benefit of infinite beings. The page thanks the kind contribution of Rinpoche's disciples, making available to us some of their most beautiful photos for the benefit of all beings.